A few times a year I am privileged to get to volunteer with Team Expansion at a display they sponsor, The Wall of Unreached Peoples. The movement, Unleashed for the Unreached, was started in 2011 to bring awareness to the number of unreached (or unengaged) people groups in the world... groups of people, whether 20 or 2 million, that are still not aware of the Good News of Jesus Christ. Many have never heard His name, and are unaware of His great love for them. 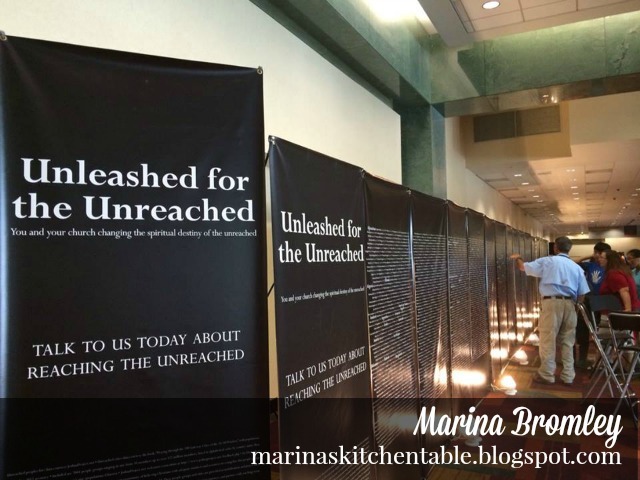 You can find out all the specifics here, at the website for Unleashed for the Unreached. We spend time talking to others about the display, asking them to prayerfully choose a people group to pray for - then share the information with their family, small group, or church, hoping that as they pray for their chosen people group their awareness will increase and a passion for them to KNOW Jesus will develop. In some instances, some churches have actually gone to that place, come to know people there, and built a ministry to reach them for Jesus. There are others working at The Wall that are praying, asking God to intercede on behalf of the people groups, praying for the visitors at the convention to be curious about the display and adopt a people group to pray for, and of course, for some to become passionate enough to bring the gospel to these unreached areas of the world. I am asking that you would pray for me, the other volunteers working at the display, and the guests at the convention. That the display will be successful, that God will be honored in our small gifts of time and prayer, and allow spiritual forces to be bound and His Word to be unleashed among the unreached people groups of the world.